The Sandwich, Massachusetts, Heritage Museum drove a flim flam now being challenged by local Cape Cod residents. A big problem has become destruction of trust. Heritage initially listed the wrong permit application address (67 Grove Street), resulting in no neighbor notifications. The actual address for the aerial park is 0 Shawme Road and 0 Pocasset Road. Nearby neighbors & abutters had minimal chance to challenge the project. Terrible! ...this stinks. The adventure park is operated by Outdoor Venture Group of Connecticut, with a pattern of Continental trickery. 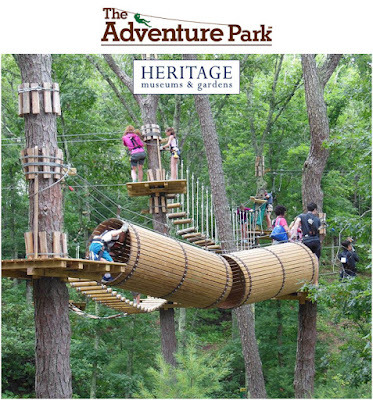 The Connecticut firm partnered as well with TreeTop Adventures of Canton, MA whose address was also misrepresented, and for which their license to operate was subsequently ordered withdrawn (link). Many people reportedly are both distrustful and disgusted. Any improper application should be rejected when incomplete or false (even if mistakenly first permitted).